Recently, the sun's been shining on Yorkshire and it's been lush. A couple of weeks ago a group of us took a trip to Gormire Lake on a cloudy but warm Saturday. Though I didn't go in for a dip that time, it sprung my imagination about where the places are to go wild swimming in Yorkshire. Who needs the sea when there are bounties of pure water to dive into? Spanish plume or wetsuit weather, there's nothing quite like it. One of only two natural lakes in the county, Gormire Lake sits below Sutton Bank (which I wrote about here). There was a slight chill in the August air as we disbanded our vehicles and walked up, through the trees. The myth goes that there's an underwater city located at the bottom of the lake, which I'm not so sure about but it certainly feels incredibly mystical. While we were there, another group had set up an amazing camp, complete with canoes and a launching seat - to force those not so keen on a wild swim in, perhaps! Wain Wath Force is fairly near to Richmond, North Yorkshire, out in the Dales past Reeth and the beautiful village of Low Row. It looks like the perfect place to take the plunge! 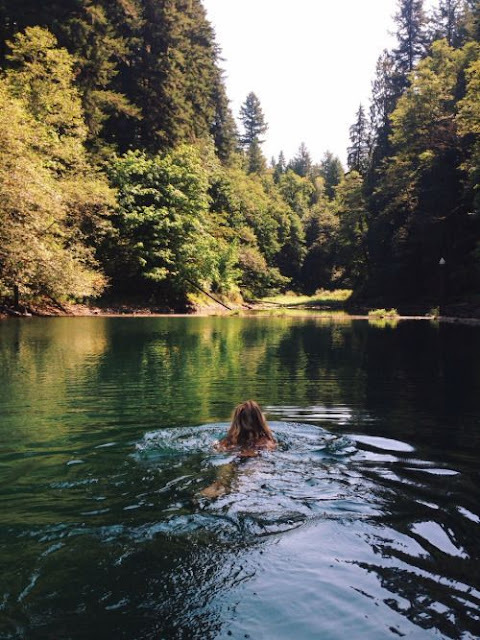 This river has everything you need for a wild swim. I've been reading in particular about Loup Scar, a short limestone gorge, just by the village Burnsall which is apparently best for jumps! Where the river meets Collingham is apparently a great place for a paddle. Have you been wild swimming in Yorkshire? Where would you recommend?